As for the name, there is a claim that the title is a reference to the miracle-worker St. Anne (whose name would have been Hannah), the mother of Mary, and so grandmother of Jesus. There’s also a claim that it’s named after a bay which was named after St. Anne — though there are actually two bays by that name in the region of North America, the one at Englishtown on Cape Breton Island being the apt choice as the referent, since St. Anne’s Bay in Jamaica would be odd . . . though admittedly Hana Bay in Hawaii would be more odd. As for its age, a few people claim this tune (or its ancestor) is from the Renaissance (which would put it within the years of 1450 to 1600 CE) while some say it is an old Irish reel, others that it’s a old contra-dance tune, and still others that it’s an old Shetland tune. Of course, it’s not at all clear how old “old” is in these cases. 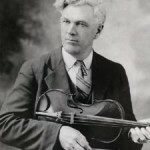 What does seem clear is that in more recent times, in the 1930’s say, it was (again) made popular by the Quebec composer and fiddler Joseph Allard (1873-1947) — who performed and recorded under the professional name Maxime Toupin and toured the U.S. picking up many tunes from Irish and Scottish musicians he met along the way. Although people who have multiple names are untrustworthy, it is also clear that “St. Anne’s Reel” began to gain popularity among a wide range of players around the 1940s and has since become firmly adopted by players in Ireland, England, Scotland, the North America (esp. New England, Canada, and Midwestern U.S.), and Australia. Perhaps due to Allard, it is often claimed to be a French-Canadian tune. 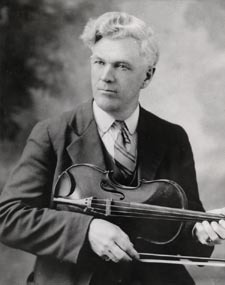 So much so that if you come across an old-time fiddler and asked “Know any Canadian tunes?” you’re very likely hear “St. Anne’s Reel.” Of course, it started to be a staple of Midwest fiddling, especially in northern Missouri, in the 1950s and 1960s, and maybe that’s why some say it’s an American old-time tune. What is also clear is that it is a well-liked tune for many, but not all. If you’re among the right group, then the tune is likely to create a rousing moment during a session. As for what aspects of the hear-say here reflect facts, you’ll just have to bring up the question during your local session. I’m sure it will be much appreciated. This article was posted in ABC format, Dots, MP3, Reel, Slow Session, Tune, Tune Comment. Bookmark the permalink. Follow comments with the RSS feed for this post.Post a Comment or leave a trackback: Trackback URL. I’m excited to have found this on the internet–quite by accident! I’m a low-intermediate fiddler with a slow ear. I thank you for this valuable resource!